Keppel FELS Limited (Keppel FELS), a wholly owned subsidiary of Keppel Offshore & Marine Ltd (Keppel O&M), has secured a contract from Crystal Heights Holdings Limited, a company specializing in the offshore oil and gas market, to build a high specification liftboat worth $85 million. The liftboat is designed by Keppel O&M's liftboat design specialist, Bennett Offshore in collaboration with Keppel FELS. Scheduled for delivery in 4Q 2017, the liftboat will have provisions enabling it to operate in China, the Middle East and the Gulf of Mexico. Liftboats are dedicated vessels used to support offshore platforms in construction, accommodation and well intervention as well as maintenance and installation. Keppel FELS Limited (Keppel FELS), a wholly owned subsidiary of Keppel Offshore & Marine Ltd (Keppel O&M), has delivered a KFELS B Class jackup rig to Mexican national oil company, Petróleos Mexicanos (PEMEX), safely, on time and on budget. The rig was named Kukulkan by Lady Sponsor Mrs Valerie Pahl-Hernandez, wife of Mr Gustavo Hernandez Garcia, Director General of PEMEX Exploration & Production, at a ceremony at Keppel FELS this evening. Kukulkan is the second jackup rig Keppel has built directly for PEMEX. Keppel FELS Limited has delivered the ultra-harsh jackup rig, Maersk Integrator, to Maersk Drilling, a wholly owned subsidiary of A.P. Moller - Maersk A/S, thirty days ahead of schedule, on budget and with a perfect safety record. The rig was named at a ceremony today in Keppel FELS by Ms Margareth Øvrum, Executive Vice President, Technology, Projects and Drilling, Statoil. Maersk Integrator is an XL Enhanced (XLE) harsh environment jackup rig and the third in the XLE series delivered to Maersk Drilling. Keppel FELS Limited, a wholly owned subsidiary of Keppel Offshore & Marine, has secured a contract from Gulf Drilling International Ltd. of Qatar to build a repeat high-specification KFELS B Class jackup rig worth US$227 million. As part of the contract, GDI has options for two more KFELS B Class rigs for deliveries in 2017. On the new jackup, to be named Halul, Keppel FELS has already begun preparations for its scheduled delivery in 1Q 2016 during the course of discussions with GDI. Upon delivery, Halul will be chartered to Qatar Petroleum for five years. 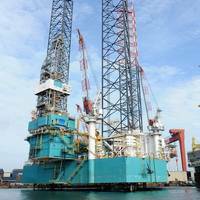 Keppel FELS Limited has delivered the jackup rig XLE-2 to Maersk Drilling, a wholly owned subsidiary of A.P. Moller - Maersk A/S, on budget and seven days ahead of schedule. The rig, which will be named at a ceremony in Norway in October 2014, is a XL Enhanced (XLE) harsh environment jackup rig. It has been customised for operations in the North Sea and has been chartered by Det norske oljeselskap ASA (Det norske) for deployment in the Ivar Aasen project in Norway for five years. The accommodation jackup rig with Plug & Abandonment (P&A) features will be based on Keppel’s KFELS J Class design which is suited for the harsh environment of the Norwegian North Sea. Keppel FELS Limited (Keppel FELS), a wholly owned subsidiary of Keppel Offshore & Marine (Keppel O&M) has signed an engineering services agreement with Workfox B.V, a subsidiary of the Seafox Group (Seafox), to embark on an engineering study of a purpose-built accommodation jackup rig with well intervention and P&A features. Keppel FELS Limited (Keppel FELS), a wholly owned subsidiary of Keppel Offshore & Marine (Keppel O&M), has secured contracts to build three high-specification KFELS B Class jackup rigs worth about $650 million (USD) from new customer Fecon International Corp. (Fecon). Backed by experienced industrial entrepreneur, A.P. Dobrov, Fecon is a new player to the offshore oil and gas industry, and is targeting the growing offshore drilling markets of Africa, Middle East, and Southeast Asia. In addition, Fecon's leadership team has extensive connections, experience and knowledge of working in Russia and has identified offshore drilling in Russia as a strategic market with good growth opportunities. The three rigs are scheduled to be delivered progressively within 2H 2016. Mr A.P. Keppel FELS Limited, a subsidiary of Keppel Offshore & Marine Ltd (Keppel O&M), has secured a contract from UMW Drilling 8 Ltd, a wholly-owned subsidiary of UMW Oil & Gas Corporation Sdn. Bhd., for a KFELS B Class jackup rig worth $218 million (USD). It will be the third KFELS B Class jackup rig for UMW Oil & Gas and is scheduled for delivery in 3Q 2015. The first jackup - UMW NAGA 4 - was delivered in February 2013 and the second - UMW NAGA 5 - is expected to be completed by 2Q 2014. Keppel FELS Limited (Keppel FELS) celebrated the naming of their third consecutive accommodation semisubmersible (semi) rig built for Floatel International Ltd (Floatel). The rig will be delivered more than four months ahead of schedule and within budget. The rig was named Floatel Victory on November 19, 2013 at Keppel FELS and will be chartered to Chevron for work in the Gulf of Mexico and BP in the West Shetlands. The first two accommodation semis – Floatel Superior and Floatel Reliance – which Keppel FELS had built for Floatel, were delivered in 2010 to the same high standards of execution. 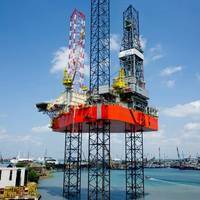 Keppel FELS Limited has secured a repeat order from a subsidiary of Transocean Ltd. (Transocean) to build 5 KFELS Super B Class jackup rigs for US$1.1 billion. The rigs are scheduled to be delivered progressively from 1Q 2016 to 3Q 2017. In addition, Transocean has options to build up to another five similar jackup rigs with Keppel FELS. Tailored to suit Transocean's requirements, the KFELS Super B Class rigs are designed to operate in 400 feet water depth and drill to 35,000 feet. Keppel FELS Limited (Keppel FELS), a wholly-owned subsidiary of Keppel Offshore & Marine (Keppel O&M) has secured a contract from an affiliate of Clearwater Capital Partners (Clearwater) to build a pair of premium KFELS B Class jackup rigs. The total cost of the project is about $440 million (USD), which also includes owner furnished equipment and project management fees. 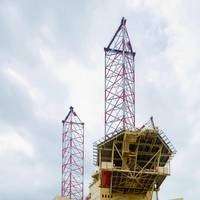 The rigs are scheduled to be completed in 4Q 2015 and 1Q 2016. Wong Kok Seng, Managing Director (Offshore) of Keppel O&M and Managing Director of Keppel FELS said Keppel FELS has 49 KFELS B Class/Super B Class jackup rigs already delivered and 17 on order. The KFELS B Class jackup rig is able to operate in water depths of up to 400 feet, drill to 30,000 feet deep and equipped with offline standbuilding capability. Keppel FELS Limited (Keppel FELS) is pleased to announce that PV Drilling Overseas (PVDO) is acquiring from the company a KFELS B Class jackup rig for approximately $210 million. 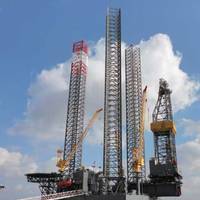 Scheduled for delivery in 1Q 2015, the high specification rig will be the 19th KFELS B Class rig on order at Keppel, with 45 already delivered since 2000. Pham Tien Dung, Chairman of PVDO and CEO of PV Drilling said, "We are looking to catch up on the huge demand for offshore rigs and actively seize the opportunities coming. To meet this aim, we are pleased to be able to acquire a premium jackup rig with such an early delivery schedule. The KFELS B Class jackup design was developed by Keppel's technology arm, Offshore Technology Development. Keppel Offshore & Marine’s 2013 to-date total to $1.8 billion (USD). Mr. Wong Kok Seng, Managing Director (Offshore) of Keppel O&M and Managing Director of Keppel FELS said, "Falcon Energy entered the offshore oil drilling business when they ordered two jackup rigs from China in 2011 ... Falcon Energy has chosen the KFELS Super B Class design for their new high specification jackup rig, which will be built at our yard in Singapore. 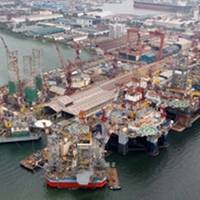 "So far this year, Keppel FELS has already delivered six rigs ahead of schedule, safely and on budget. For the latest delivery of AOD II, a KFELS B Class jackup, to Asia Offshore Drilling, we received a bonus of about US$2 million for completing the rig 62 days early. Keppel FELS Limited, a wholly-owned subsidiary of Keppel Offshore & Marine has secured a contract to construct a KFELS B Class jackup rig, ENSCO 110, from Ensco plc. The construction cost, together with the commissioning, systems integration testing and project management is expected to be approximately $225 million (USD). It is the 61st KFELS B Class Jackup ordered since 2000. When completed in 1Q 2015, it will be the fourth KFELS B Class Bigfoot jackup rig in Ensco's fleet. Keppel has built a long-term partnership with Ensco having delivered 16 newbuild projects to them with another four on order, including this latest contract. The KFELS B Class Bigfoot rig is able to operate in water depths of up to 400 feet and drill to 30,000 feet deep. Keppel FELS Limited (Keppel FELS), a wholly owned subsidiary of Keppel Offshore & Marine Ltd (Keppel O&M), has signed a contract with Ukraine's National Joint-Stock Company "Naftogaz of Ukraine" (Naftogaz), to construct two semisubmersible drilling rigs worth about US$1.2 billion. The contract will be effective upon final corporate approvals. This follows an earlier announcement made on 21 November 2012 in relation to Keppel FELS being selected as winner of the tender to construct the two semisubmersible drilling rigs. The rigs will be built to Keppel FELS' proprietary DSSTM 38U design which is customised for the Black Sea environment. The harsh weather conditions of the Black Sea include extreme freezing temperatures, storms with strong winds and heavy seas. 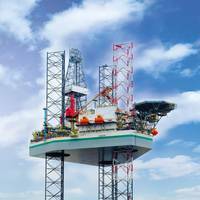 Keppel FELS Limited (Keppel FELS) has delivered Paradise 400, a high-specification KFELS B Class jackup rig to Safin Gulf FZCO (Safin) ahead of schedule and with a strong safety record. 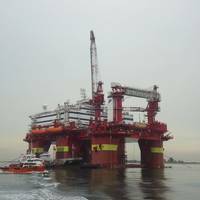 The rig is a refurbishment and upgrade of a KFELS B Class jackup rig that Keppel FELS purchased in 2011. Developed by Keppel's jackup rig design arm, Offshore Technology Development, the KFELS B Class rig is able to operate in water depths of 400 ft with a drilling depth of 30,000 ft. It is equipped with a full 15,000 psi BOP system, 70-feet cantilever outreach, with upgraded mud pit storage capacity of 4,000 bbls and accommodation for up to 150 personnel. Mr Raimonds Namikis, Executive Vice President of Safin said, "Ordering this rig has been a good investment for us.